Behemoth - one of the largest land animals on the planet. His weight sometimes reaches 4 tons. This is an amazing animal lives in the vast Africa and is a semi-aquatic lifestyle. The strength of the bite hippo is 230 kg. Proportionally hippo head one of the greatest goals in the world. With its huge light, a hippo can hold their breath up to 5 minutes. Нippo's mouth can open nearly 120 centimeters. In hot weather or when the hippo is long in the sun, his skin turns pink. It's not a tan, and a special substance that is extracted from the skin to protect against erosion of the skin. We have properties hippo skin antibiotic, it promotes decontamination and rapid healing of wounds. The most dangerous animal in Africa for a man is not a lion or a crocodile and hippopotamus. Life expectancy depends on the hippo teeth amortization. If the teeth are completely erased, the animal will not be able to chew food, so that die of hunger. Hippos live exclusively in fresh water and is absolutely not suited for life in salt water. 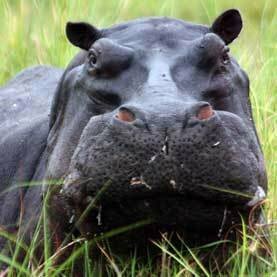 All hippos are born in water. In search of hippos suitable food can pass through 10 km per night. The older female or male, the greater their weight. Hippos and whales evolved from a common ancestor. In the wild, an adult hippo practically no enemies. Prey lion or crocodile can only be a weak animal or a calf. Hippos can make sounds like over the water and under the water. Hippos can be very fast in the water too,because in the water doesnt matter how heavy your body is, this is a think that the people who visit those places forget and somethis beacuse of that accidents happen.